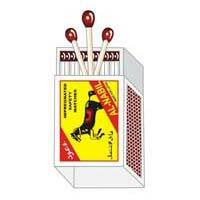 Swarna Match Factory is a part of Swarna International. After starting as small unit, with its complete dedication to customer satisfaction have scaled new heights of excellence. With its quality products and unmatched services has created unique space in the market and able to serve valued customers. With wide range of products, which are of inevitable use in daily life, we continue to strive to produce more effective and efficient Safety Matches.